Fab, Fast and Fun Caricatures in Kingston upon Thames. From table hopping at Weddings, Walkabout Artist at Award Ceremonies to a Event Cartoonist at a 50th birthday blast and loads more. He’ll humour your guests, and capture convincing funny faces in minutes. Conversation piece! Groves Caricatures (best known as Dave) is available for hire at weddings, parties and events in the Kingston upon Thames area, Richmond, Wimbledon, Putney, Surbiton, Twickenham, Teddington, Chiswick, Hammersmith, Barnes, Kew, Wandsworth, Houslow, Isleworth, Some venues I’ve recently attended to draw caricatures at in Kingston upon Thames area include the Duke Meadows Golf Club in Chiswick, the Wimbledon Club, Pembroke Lodge in Richmond. Boat parties aboarding in Kingston, and travelling up the Thames. The council also commissioned me to draw street art caricatures in Eden Walk. 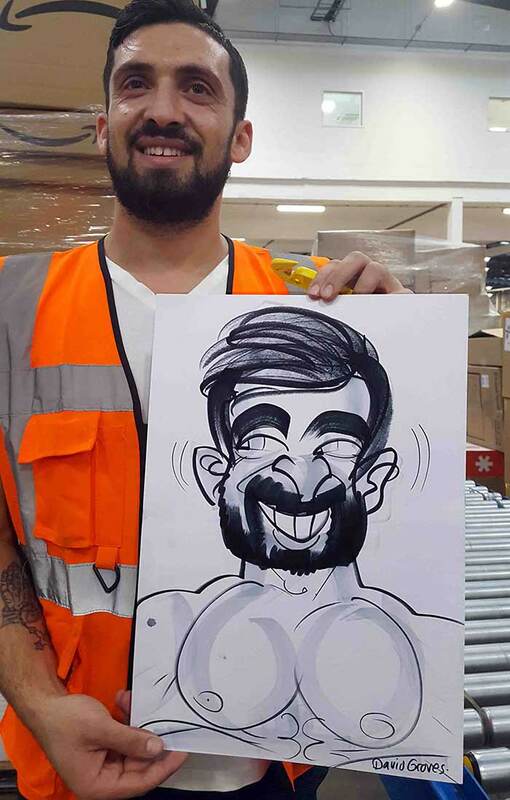 New venue’s visited in 2015- 2016 include the Radisson Edwardian Hotel close to Heathrow, drawing caricatures for a large Asian wedding, and a fairly regular gig in Heathrow Airport drawing caricatures for customers in the World Duty Free Stores, the hours are unusual but that’s because the airport never stops ? Caricature Entertainment to hire in for weddings, parties and events in the Weybridge area, Chertsey, Walton on Thames, Addlestone, Sunbury, Egham, Staines. A few venues recently attended to draw caricatures at in the Weybridge area west of Kingston includes Oatlands Park Hotel, Shepperton Cricket Club, Hersham Places Technology Park in Hersham, the Spellthorne Sports Club in Staines .